This example uses the DoMath.php script to perform math and change just the result field of a form on a page. You must use your server setup to make this example work because the server executes the PHP script and then returns the result. Using jQuery makes the process of working with AJAX significantly easier. The following code shows the form used for this task. The example uses standard <input type=”text”> controls for data input. Notice that you must define the name attributes for these controls, or the jQuery .serialize() method won’t work. It’s a good idea to assign the controls default values. The output is a simple <span>. The example places the output in a <span> with an id of result. You access this <span> by its identifier and call load() to fill it with information from the desired source. You provide the location of the source, which is DoMath.php. The PHP script requires input data, which you add as a second argument. To obtain the data, you access the <form> tag, which has an identifier of DataEntry, and you call serialize(), which serializes every control that has a name attribute assigned to it. When using the default values, the serialized data is val1=1&val2=2. Taken together, the complete URL is http://localhost/DoMath.php?val1=1&val2=2. Like XML, JSON works with any platform and with any browser. Using jQuery makes working with JSON easy. Interestingly enough, PHP provides the functions required to translate complex PHP data into JSON format. 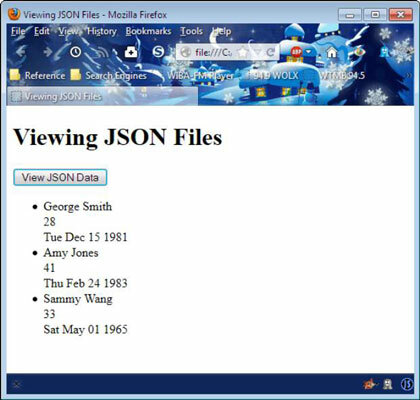 This example stores the JSON data on disk in a file. The data consists of a group of users. There are three users in the file. Each user entry has the same fields associated with it: Name, Number, and Birthday. Notice that strings appear in quotes. Numbers appear without quotes. JSON doesn’t actually provide support for standard object types, so this example uses one of the types you commonly see. The form for this example includes the heading and an <input type=”button”> control. When the user clicks the button, it calls ViewData, which is shown in the following example code. // Obtain the data from disk. // Create an array to hold the data. // each entry in the Users object. // Place the result in an unordered list. The example begins by calling .getJSON(), which loads Test.json from the drive and places the content in data. The anonymous function accepts data as input. To create the output for this example, the code creates an empty array, items. Using items simplifies the code. The next step is to process each of the user entries in the Users array found in Test.json. The code calls .each() and passes it data.Users, so that the loop will process each of the object literals it contains. The anonymous function receives a key and value pair for each of the user entries. To access each of the key/value pairs for the object literal entries, you interact with the appropriate properties: Name, Number, and Birthday. Processing Name and Number is straightforward — simply pass them to the output as is. To process the odd-looking .NET date, you must separate the text part from the numeric part of the string and then turn that value into an integer that contains the number of milliseconds since January 1, 1970. If you want to provide a date earlier than January 1, 1970, you use a negative number of milliseconds. The number of milliseconds is used to create a new Date() object. The code calls toDateString() to provide nicer-looking output. At this point, items contains three array elements, each of which is a list item <li> tag containing facts about the users. The code creates a new unordered list <ul> tag and places items within it by calling join(). The resulting list is added to the current document by using the appendTo() method.